Another Chevy Bolt EV police interceptor. Police in Dubai (United Arab Emirates) have new electric cars. Eight Chevrolet Bolt EVs began patrolling the roads on September 28. We are not surprised as the Dubai Police fleet is full of exotics or plug-in models, including cars like the BMW i8 and even the Renault Twizy. "With an impressive line-up of hybrid and electric vehicles in the police force already, the Chevrolet Bolt EV offers long-range practicality of up to 520 kilometres on a single charge unprecedented in its segment. Dedicated to being a key driver in the regions motoring landscape, General Motors EV efforts fall in line with the Dubai Governments vision for more sustainable and smart mobility solutions." Chevrolet Bolt EV entered the United Arab Emirates market this summer. By 2020, 10% of government fleets are to be electric, which means more electric car shopping like this. "This partnership with Chevrolet is part of our ongoing commitment to better serve the citizens and residents of Dubai while also leading the way in Dubais green initiative. 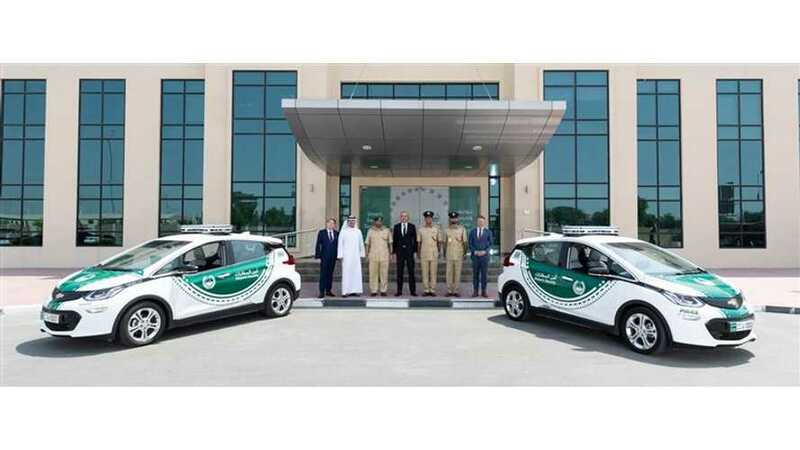 The addition of eight Chevrolet Bolt EV cars to our Dubai Police electric fleet will make a big impact in our mission to raise awareness around the benefits of electrification within the Emirate." "We are proud to support the Dubai Government in its vision to make the Emirate a greener city. The Dubai Green Mobility Initiative has set some ambitious targets, including a 10% penetration of alternate propulsion vehicles in government fleets by 2020. This is a bold target, and we look forward to being equally bold in General Motors role as a reliable partner, with the Chevrolet Bolt EV forming the backbone of these fleets, starting with the world-famous Dubai Police fleet." "As one of the Emirates leading dealerships, we have a strong relationship with the Dubai Police and remain firmly committed to supporting them in creating a sustainable landscape in future mobility. We are extremely proud to be handing over these Chevrolet Bolt EV units, signifying our dedication to bringing innovation that complements the direction of the Dubai government."